Another day, another record..Saturday the 7th of January 2017 was a good, relaxing day for Manchester United fans all over the world. The match saw ex-United defensive rock, Jaap Stam, return to Old Trafford in the opposition dugout. He received the reception of a legend from the United crowd when he lead his Reading squad unto the pitch for kick-off. But this was far from why it was a good day at the theatre of dream..
Manchester United had another easy (not necessarily convincing) game today, running through Reading 4 goals to nil. 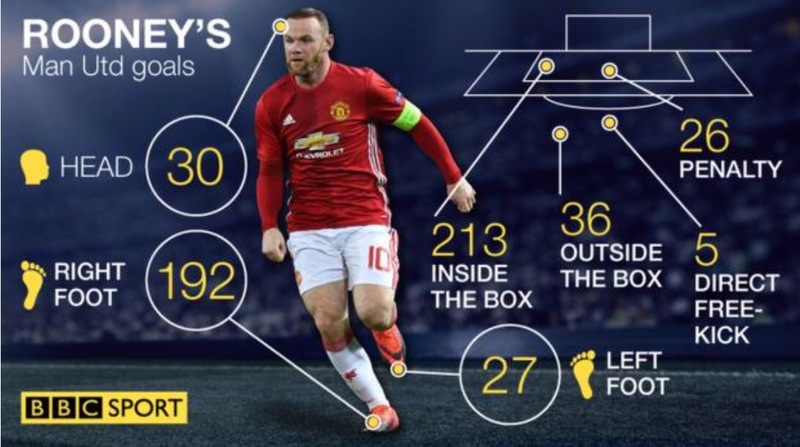 Rooney scored his 249th goal for United, equalling Sir Bobby Charlton’s record 215 games less than it took the much older legend to do it. It wasn’t necessarily a spectacular record equalling goal but it was enough to equal the record and give United the lead in the match. The goal was scored from Rooney’s leg just meeting Mata’s cross in the box and going beyond Reading’s goalie, Al-Habsi. It was the first goal of the day and it earned a standing ovation from the Old Trafford faithful. Note, the goals recorded by Manchester United are only goals from competitive games, so this excludes every friendly and tour Rooney has ever played in for Manchester United. The team fielded by Mourinho was made up mostly of players who haven’t featured so often or have had bit-part roles like Romero, Young, Smalling, Fellaini, Rooney, Martial and Rashford (see picture above). Luke Shaw was pencilled in to feature in the match but was pulled out of the team due to illness while Marcos Rojo seemed to have taken a knock early in the game and was replaced by Phil Jones. As a believer in the midfield being the most important part of any team I would tell you that, despite our good outing, it wasn’t the stuff made of dreams. Don’t get me wrong it wasn’t a bad show but not as good as with ‘Porrera’ (Pogba and Herrera). Rooney and Mata did their lot in supporting the midfield though and added mobility where Carrick and Fellaini lacked it. With Fellaini you don’t get that gusto in the midfield, he did his job well in aerial duels and showing up where the ball is but this tends to be the exact problem; he drifts and doesn’t recover so well, he is the sort of player that needs people to adapt to his game not vice-versa (the reason Everton’s play was built around him). This is where Carrick earns his stripes as a genius, the way he plugs up holes in the team and reads the movement of the opposition you’d think Fellaini was bossing too. Speaking of Carrick it is well known that he is United’s Mikel Obi when it comes to scoring goals but today I saw him make at least 2 shots with one just going wide of the post. All in all, dude was obvious today and he bossed that midfield. In the first half Anthony Martial was the most active United player and caused Reading’s defence many troubles including ex-United youth player, Tyler Blackett. In the build up to Rooney’s goal he demolished the dignity of two Reading defenders and scored one of his 8 minutes later after pulling out the same magic. Rashford who replaced Zlatan in the No. 9 role was also very active, spreading the defence as the tail him from the wings through to the middle. It was this movement that allowed him 6 shots, with 3 off target and gifting the keeper only one. This was the second brace Marcus Rashford scored for United since Arsenal visited Old Trafford in February last year. His first goal which came in the second half was from a defence splitting pass by Chris Smalling which the young lad happily buried in the net, while the second was from a ‘lago’ (mistimed kick) by Reading’s goal keeper… I pity the guy because Rashford didn’t waste time to hop on that and bed the game. His finishing could improve though, twice he was gifted through balls on the right side of the box only for him to pull it wide in an effort to round off the keeper; it was one of these shots Reading’s keeper was able to save with the second hitting the side netting. All in all it was a very satisfying outing for Manchester United, having their 8th consecutive victory in all competitions and a well-rested team ahead of the clashes against Hull city this Tuesday and Liverpool on Saturday. We even got to see a bit of Tim-Fosu Mensah and Bastian Schweinsteiger (who seems to be really slowing down with age). Well that’s all for today, till next time..